United States President Barack Obama extended sanctions on Thursday that bans US companies from doing business with alleged Colombian drug traffickers. Obama chose to extend the list against drug traffickers operating in Colombia arguing they “continue to pose a threat” to the US. 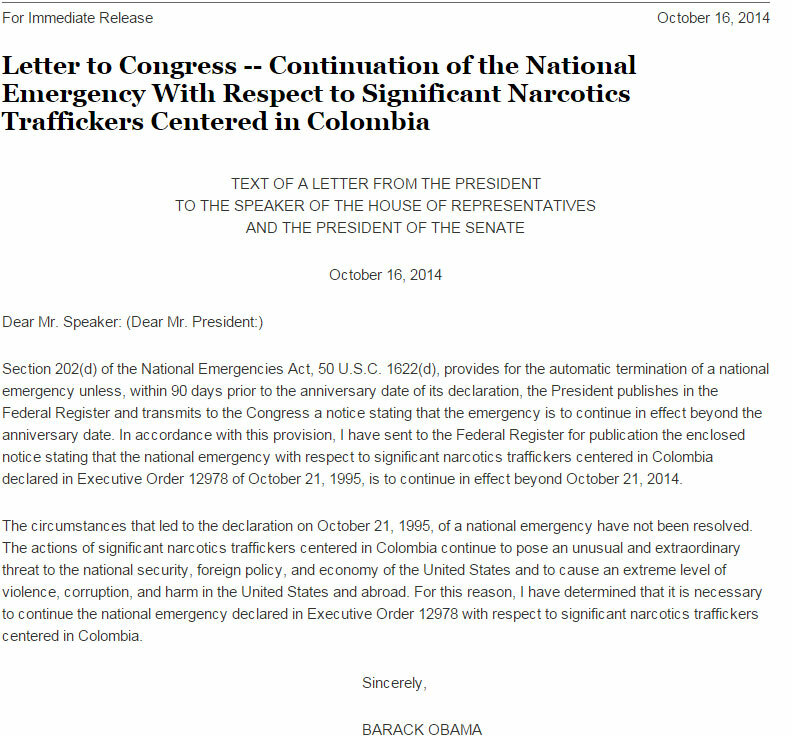 In a letter sent to Congress and released by the White House, Obama said he would extend the “national emergency” against drug traffickers based in Colombia for one year. “The circumstances that led to the declaration on October 21, 1995, of a national emergency have not been resolved. The actions of significant narcotics traffickers centered in Colombia continue to pose an unusual and extraordinary threat to the national security, foreign policy, and economy of the United States and to cause an extreme level of violence, corruption, and harm in the United States and abroad,” said the president. The US Treasury Department’s Specially Designated Nationals List, or The Kingpin Act, is compiled by the Office of Foreign Asset Control. The list orders the suspension of all illegal activities of the individuals or groups named and prohibits any US citizen from making transactions with these entities. This “national emergency,” which requires an annual extension, is an executive order from 1995 first used by former President Bill Clinton. The order establishes a series of special measures to address the threat of criminal groups that are key in drug trafficking. Among others 17 members of the neo-paramilitary group “Los Urabeños” are on the list.